This has been the most fun of all the avenues of cleaning. Where else can you clean something and make it feel soft and supple again? 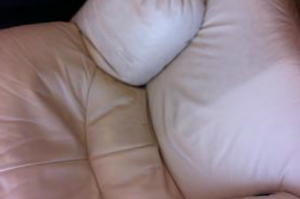 We can take that old, dry leather and restore it to a like new condition. This works with protected, analine, and in some cases even nubuck (otherwise known as suede). Some leathers don’t respond to cleaning, so schedule your free inspection today to find if your leather furniture can respond to cleaning and conditioning.